"A powerful new perspective on the tragic life of Anne Boleyn ... an original, sympathetic and moving portrait of the queen's final days." - Award-winning writer Julian Novtitz. IN THE WINTER OF 1535, fourteen-year-old Kate Carey desperately wants to escape her family home. She thinks her life will be so much better with Anne Boleyn, who is both Henry VIII's second wife and the aunt she idolises. Little does Kate know that by going to attend Anne Boleyn she will discover love, and a secret that will shake the very foundations of her identity. As an attendant to Anne Boleyn, Kate is also swept up in events that see her witness her aunt's darkest days. By the time winter ends, Kate will be changed forever. 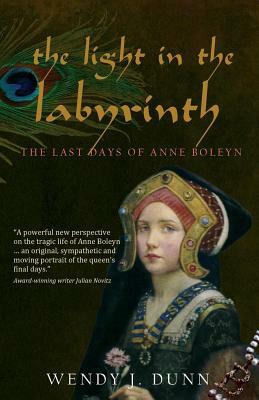 "The Light in the Labyrinth is the compelling story of a teenager who witnesses the final days of Anne Boleyn, the tragic second wife of Henry VIII. Young adults will be enthralled by the romance and political suspense swirling around the court of the notorious Henry VIII, and they will fall in love with Queen Anne in Dunn's wonderful retelling of her tragic story." - Sandra Worth, author of the award-winning Rose of York trilogy. "Wendy J. Dunn explores the final days of Queen Anne Boleyn through the eyes of the 14 year old Catherine Carey, and in doing so composes a lovely and poignant "coming of age" story. Though written in the third person, the novel is composed solely through the narrator's glimpse inside the keyhole of Catherine Carey's experiences. In using this approach, Queen Anne Boleyn's tragic final five months of life take on the drama, magical thinking, naivety and raw emotion so common of early teenagers." "The Light in the Labyrinth is quite the read - no matter the age of the reader. And yes, thanks to Kate, a new voice has been added to the well-known haunting melody - a voice that mellows and matures as the story evolves and yet retains a touch of bitter-sweet innocence right to the bloody, inevitable end. It is with regret I close the covers on Kate's story..."
Wendy J. Dunn is an Australian writer who has been obsessed by Anne Boleyn and Tudor History since she was ten years old. She is the author of two Tudor novels: "Dear Heart, How Like You This?," the winner of the 2003 Glyph Fiction Award and 2004 runner up in the Eric Hoffer Award for Commercial Fiction, and "The Light in the Labyrinth," her first young adult novel. Born in Melbourne, Australia, Wendy is married and the mother of three sons and one daughter--named after a certain Tudor queen, surprisingly, not Anne. She gained her Doctorate of Philosophy (Writing) from Swinburne University in 2014. Wendy also tutors at Swinburne University in their Master of Arts (Writing) program.